Ok. This photograph is not a wedding picture of a Minnesota Vikings lineman. 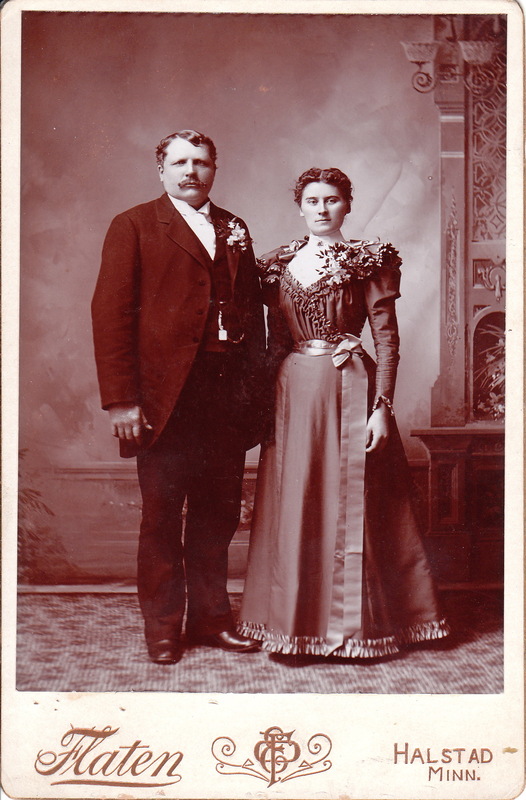 In fact, it is only a guess that this cabinet card is a wedding photograph. However, the man in the picture is built like a lineman; and the couple is dressed in the best finery of the day and adorned with flowers which appears very wedding-like. The photographer is Flaten of Halstad, Minnesota. Research reveals that Ole E. Flaten (1854 or 1865- 1933) was born in Vanders, Norway and immigrated to the United States. He operated studios in Northfield, Moorehead, and Halstad, Minnesota. He worked as a photographer from the 1870’s through the 1920’s, retiring in 1930. He had a studio in Halstad in 1894 through 1895. Check out another photograph by Flaten by clicking on the category of “Photographer: Flaten”. I would say it is a wedding photo. The corsage is the give-away. Women had a tendency to wear them more than veils, white, or even carry flowers. This is just an incredible photo – and I have dozens of wedding photos from the era.